If it rains heavily on Thursday night, some elderly Chinese will say it is because Zhinu, or the Weaving Maid, is crying on the day she met her husband Niulang, or the Cowherd, on the Milky Way. Most Chinese remember being told this romantic tragedy when they were children on Qixi, or the Seventh Night Festival, which falls on the seventh day of the seventh lunar month, which is usually in early August. This year it falls on Thursday, August 11. 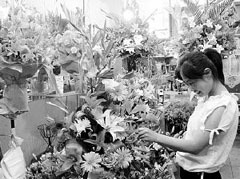 In bygone days, Qixi was not only a special day for lovers, but also for girls. It is also known as the "Begging for Skills Festival" or "Daughters' Festival." 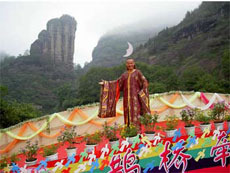 In the past, girls would conduct a ceremony to beg Zhinu for wisdom, dexterity and a satisfying marriage in the future. This was not the case all over China, as the festival varied from region to region. In some parts of Shandong Province, young women offered fruit and pastries to pray for a bright mind. If spiders were seen to weave webs on sacrificial objects, it was believed the Waving Girl was offering positive feedback. In other regions, seven close friends would gather to make dumplings. They put into three separate dumplings a needle, a copper coin and a red date, which represented perfect needlework skills, good fortune and an early marriage. Girls also held weaving and needlework competitions to see who had the best hands and the brightest mind, both prerequisites for making a good wife and mother in ancient China. Young women in southern China used to weave small handicrafts with colored paper, grass and thread. Afterwards, they competed to pass a thread through the eyes of seven needles in a single breath. 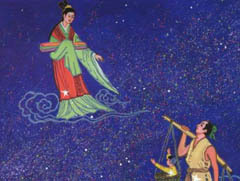 The love story of Niulang and Zhinu, and the Qixi Festival have been handed down for generations. Yet these ancient traditions and customs are slowly dying out. Many modern Chinese, particularly youngsters, seem to know more about St Valentine's Day on February 14, characterized by bouquets of roses, chocolates and romantic candlelight dinners, than they do about their home-grown day for lovers. Even Qixi is nowadays referred to as the "Chinese Valentine's Day." Fewer people than ever will gaze at the heavens on Thursday to pick out the two stars shining bright on either side of the Milky Way, that is, if people even know on which day Qixi falls. There are ready reminders dotted about, in the form of big ads saying "Sales on Chinese Valentine's Day!" in shops, hotels and restaurants. But few young women will mark the festival with their boyfriends, or take part in traditional activities to pray for cleverness. "I really have no idea about the 'Begging for Skills Festival.' I thought Qixi was only connected to the fairytale," said Wang Yilin, 24, a young woman working for a website in Beijing. 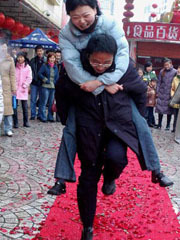 Wang's lack of awareness about Qixi's cultural implications is common among young Chinese women. In modern society, a girl is no longer required to excel at weaving or needlework, so praying for dexterous hands holds no special meaning. But this is not to say the interest in needlework is dead and buried, as the skill sets of some young women have evolved from mending clothes and sewing buttons to making unique handicrafts. Wang Yilin is actually quite handy with a needle and thread, herself. "I think my earliest creation was a hat. It was quite easy as I just tied a knot in every corner of my handkerchief," she said laughing. She tried tailoring a skirt for her doll by sewing pieces of cloth together, but found it a hard task. "I used to cover all buttons with beautiful cloth, and knitted colorful wool into different shapes to put them on my key ring," she added. The need to operate sewing machines and knit has dwindled in recent years as there is a glut of quality clothing available in shops and on the Internet, which is a change from the time of their mothers and grandmothers for whom knitting was an essential tool in times of shortage. Some young women have, however, fallen in love with knitting woollen scarves in recent years. "My roommate at university knitted a white scarf for her boyfriend, and then gradually all the girls in our department joined in," Wang said. Dong Yijun, 23, an office worker from Shanghai, is another scarf knitter. "It is simple to knit a scarf. And it feels satisfying to wear a homemade scarf," she said. A new form of needlework is now making waves the cross-stitch. Imported from Europe, the cross-stitch is a popular form of counted-thread embroidery, in which X-shaped stitches are used to form a picture. But this trend didn't sit well with Dong Yijun. "It causes too much trouble. I don't think I am patient enough," she said. Lin Yun, a 17-year-old high school student, is a spectator when her classmates spend time after class knitting and stitching. "Years ago we really enjoyed weaving bracelets. Soon we all got tired of it. Now there are new fashions. But we are too busy with homework. And after all, we girls prefer shopping and listening to pop music," she said. "Compared to the cross-stitch, I prefer traditional Chinese embroidery. Maybe one day I will take courses on it," Wang Yilin said. "I hope to make all kinds of embroidery patterns on hebao (a silk pocket used in ancient China). That soft cloth and colorful thread always make me excited."